Geraldine Brixton is ready to make history as the first female American astronaut. After a childhood traveling the air show circuit, she works as a pilot, so she’s more than prepared for the flying. But space demands more than operating equipment and the last obstacle in her way is also the most serious: math. Beverly Fox has made a career crunching the numbers that launch men into space. Numbers aren’t her problem: limits are. From the narrow expectations of her parents to discrimination at work, Bev’s life has been cut down over and over. Only in her hidden time after dark does she feel whole. Wanting to do her part to get a woman into space, Bev offers to help Geri conquer math. But neither anticipates her intense attraction—or that it might be shared. Together, they could soar to everything they’ve ever wanted, but will their secrets bring them crashing back to Earth? 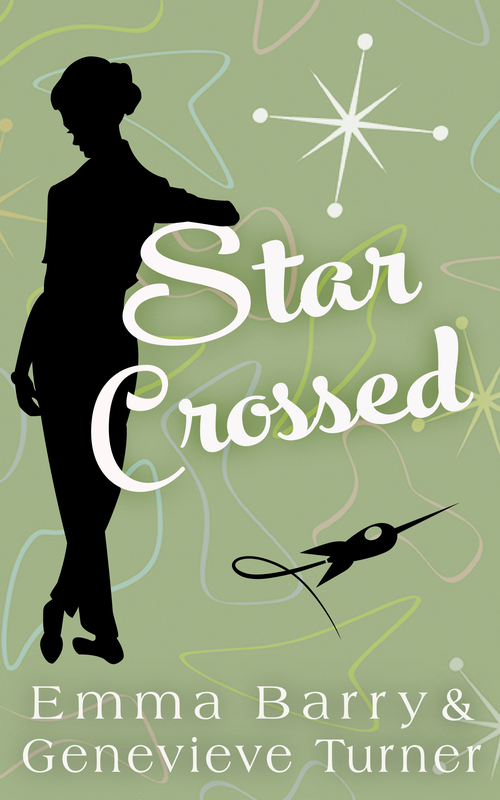 When will Star Crossed release? Sadly it won’t. We released the book very briefly in spring 2017, but after reflection, we delisted it. Here’s our first explanation about why we pulled it and the second and final statement about why we won’t publish it. For readers who are curious, I’ve kept up the cover, blurb, and preview. Why was it so difficult to find the ladies’ room? Geri knew the answer: There were no ladies’ facilities for the lady astronauts. But pondering the question gave her something to focus on as she searched the halls. She poked her head down one, scanning the row of doors. None of them looked likely. She could use the men’s room reserved for the Perseid Six, but she didn’t want to come across one of them in the process. They were already hostile enough—there was no need to invade more of their territory. The male astronauts weren’t the only ones who couldn’t wrap their heads around the idea of female astronauts. The other day, one of the engineers asked her to fetch him some coffee. She’d been on the cover of Life last week, and he still assumed she was there to serve. The mistake had angered Parsons, who’d informed the engineer she was not—in his words—“a goddamned secretary.” While Geri appreciated his motives, she wished Parsons had never said anything. Sometimes—most of the time—it was best to let things go. She’d save her complaining for something important, unlike Veronica. She turned down yet another hall, praying this one would be it. The doors to her left said “Computing Department.” Geri stopped short. There was the female computer she’d met the day they’d taken all those pictures: Dr. Eason. She ought to know where the ladies’ room was. Only, there was. A lone woman, her back to the door, dressed in a brick-red sheath, her dark, kinetic curls pulled into a bun tucked at the base of her neck. The woman’s skin was a rich brown and shimmered like satin even under the fluorescent lights. Geri’s gaze ran over the woman, her skin tingling as her heart began to pound. Oh no. This couldn’t be happening. Not here. Over the years, Geri had become proficient at suppressing her body’s instinctive reactions. The rush of blood to her cheeks and other places, the dryness of her mouth, the race of her pulse—those could all be ignored. She’d trained herself to do it. It helped when she was flying, to have such tight control over her physiology. It had certainly helped in the sensory deprivation tank. Or when they’d pumped cold water into her ear, which had been especially horrid. She’d only referred to it as merely “unpleasant” after. Suppressing her instinctive reactions had turned those little crushes of hers into simple annoyances in her other life, but to have one happen here of all places would be fatal to her ambitions. She backed out of the doorway, intending to disappear before this inconvenient response of hers could grow any worse. As that not-quite-a-smile hit her square in the chest, Geri cursed the unfairness of the world. It gave a woman inclinations and skills, and then it told her not to use them. It put someone as pretty as the woman in red on the planet, and then it told Geri not to notice. It, all of it, was a damn shame. © Emma Barry and Genevieve Turner, 2016-2017. Unauthorized use and/or duplication of this material without express and written permission from this blog’s author and/or owner is strictly prohibited. Excerpts and links may be used, provided that full and clear credit is given to Emma Barry and Genevieve Turner with appropriate and specific direction to the original content.